Information about Peach Mountain Observatory. Peach Mountain is the home of the 24” McMath Telescope and is part of Stinchfield Woods. Stinchfield Woods is owned by the University of Michigan and used by several university departments including the Astronomy Department and the School of Natural Resources and Environment. The circular structure on the left is the University of Michigan Radio Telescope. It has been in operation since 1958. The control building for the radio telescope is next to the radio dish and holds equipment that position the telescope and record data (it is difficult to see in this photograph - it is partly obscured by the dish). These operations can take place 24 hours a day even without a human operator present. The oval structure on the right is a radio telescope which was put into operation in 1955, but has not been used for many years. The rectangular building next to the small radio telescope originally held equipment that controlled the radio dish. Since that time it has been used for a variety of purposes such as research on aurora activity. It is currently used by the Astronomy Department as a dark sky observatory for astronomy students and by the Physics Department to conduct measurements on night sky brightness levels. The night sky measurements may give information on light pollution which has been a steadily increasing problem even in locations such as Peach Mountain. 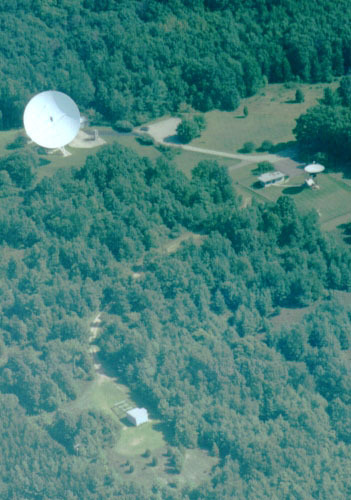 A path is visible that leads from the small radio telescope to a rectangular building near the bottom of the photograph. This building houses the Francis C. McMath Telescope. The McMath Telescope is located 700 feet from the 26 meter radio telescope on Peach Mountain. It is a rectangular building with a movable roof. This building does not have a dome. When the telescope is unused, the roof is moved over the telescope protecting it from the elements. When the telescope is used, the roof is moved out of the way allowing observations to occur. This is the telescope now used by the University Lowbrow Astronomers. The Lowbrows have made various refinements including the addition of a 6 inch refracting telescope which is permanently mounted to the side of the 24 inch telescope. The photo above shows the building housing the 24 inch McMath Telescope. This shows the southwest corner of the building. The 24 inch telescope is visible as a black tube sticking out above the building. The 6 inch refractor is the small tube above the 24 inch telescope. The roof is the white structure to the left of the building. The roof is in the open position. When the observatory is closed, the roof is moved to the closed position so that rain cannot get into the building. 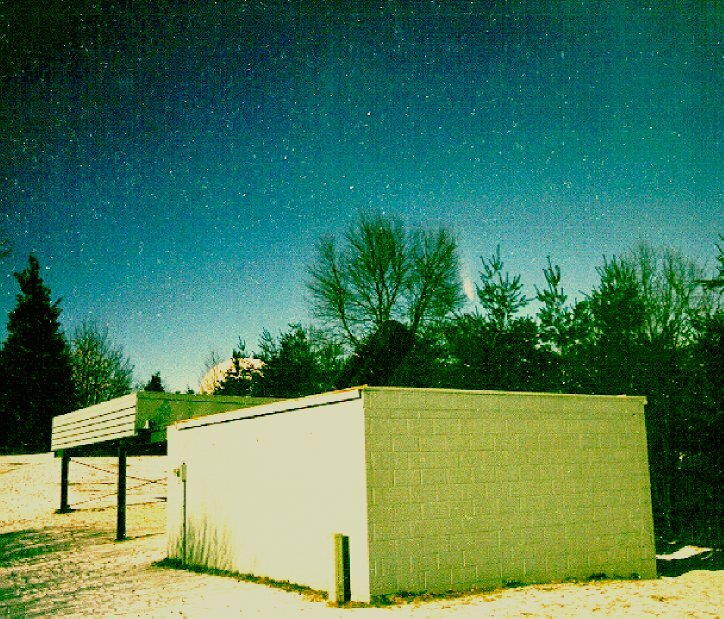 The Comet Hale-Bopp is visible between the trees. The white disk in the distance behind the observatory building is the University of Michigan Radio Telescope. This shows the north side of the observatory building. The roof is in the closed position. 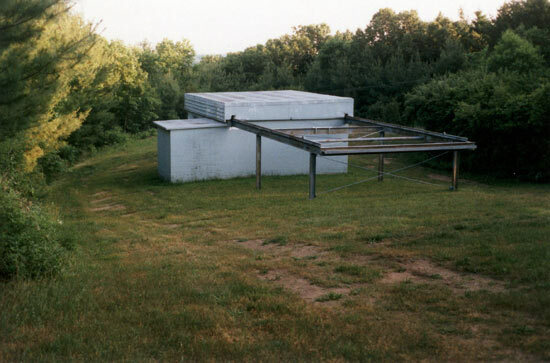 Before an observing session, the roof is moved to the open position along the railroad tracks. After an observing session the roof is returned to the closed position. Peach Mountain from the Air—Photograph by Peter Alway during the Summer of 2000. Observatory Building from the South—Photograph by Mark Vincent. 28 mm Lens, 1 minute exposure, ASA-400 Film. Taken the Morning of March 24, 1997. Observatory Building from the North—Photograph by Mike Radwick. Lowbrow Photo Album: Open Houses at Peach Mountain Observatory. The Amateur Telescope Making Subgroup (May 21, 2000). Removal of the Primary and Secondary Mirrors from the McMath Telescope (July 14, 2002). McMath Telescope Training Sessions (April 24, 2004). Perseid Meteor Shower and Campfire (August 2004). “The Francis C. McMath Memorial 24-Inch Reflecting Telescope of the McMath-Hulbert Observatory” by Robert R. McMath. History of the Observatories of the University of Michigan. Copyright © 2017, the University Lowbrow Astronomers. (The University Lowbrow Astronomers are an amateur astronomy club based in Ann Arbor, Michigan).